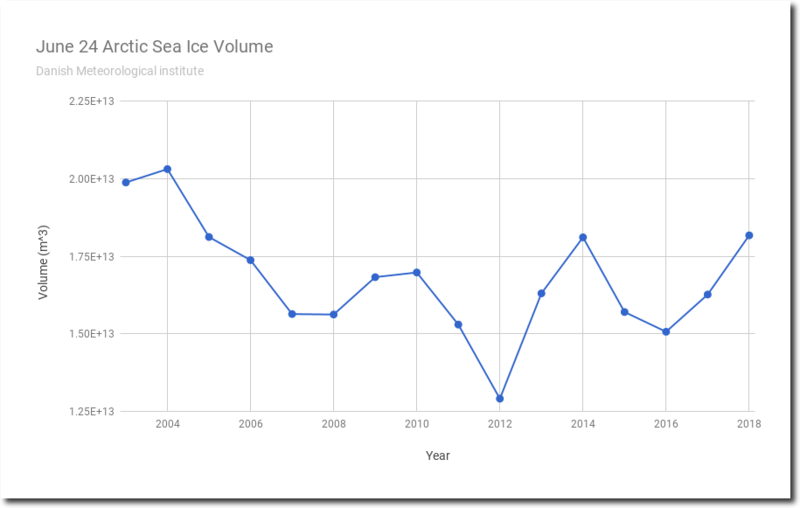 On the 10th anniversary of NASA’s ice-free in 2018 forecast, Arctic sea ice volume is the highest since 2004. Four of the five slowest melt years have occurred during the last five years. 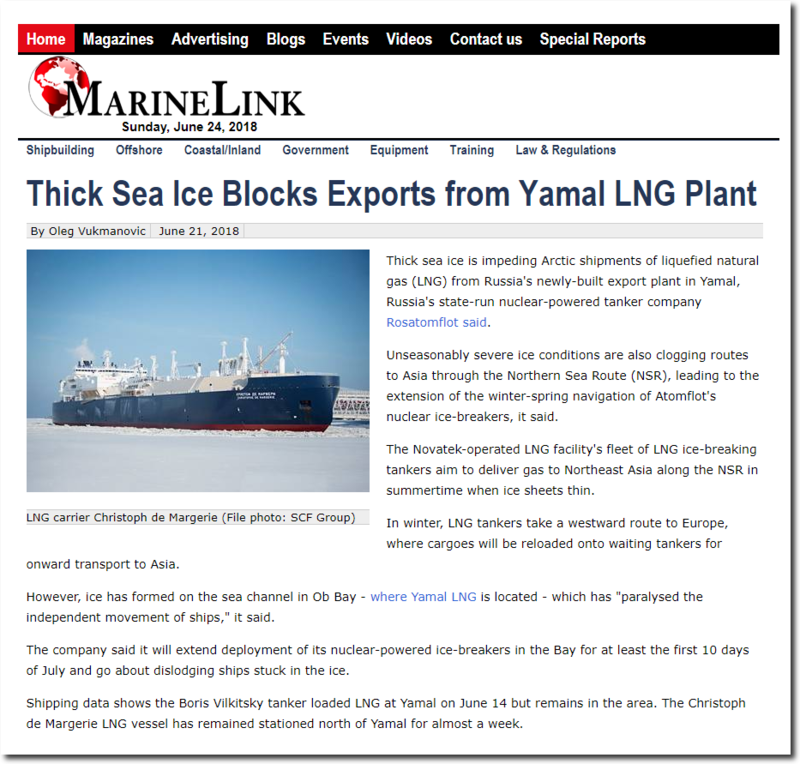 Thick sea ice is blocking both the Northern Sea Route and Northwest Passage. 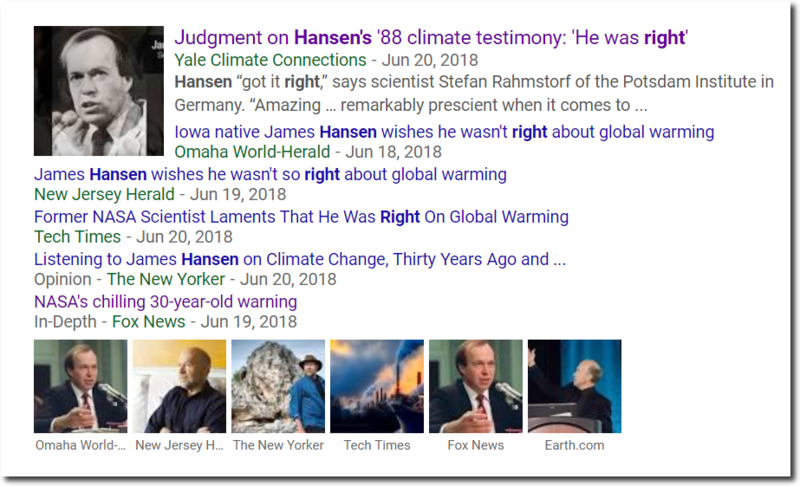 James Hansen was dead wrong about all of his forecasts over the past 30 years, so fake climate scientists and the fake news press have quite predictably ramped up their lies and claim the exact opposite. As shown, 2018 now #3, having just exceeded 2005 in yesterday’s DMI Ice Volume. Gap between 2018 and #5 2014 is 63, a little bigger than the day before. The decline rate for yesterday was the lowest of any year reported by DMI for the day of the year, 266 cukm, with 2014 and 2016 tied for 2nd lowest at 283. I have a feeling we’ll see it pass 2004 and 2003 before we’re done for the year. The current gap between 2003 and 2018 is 1700 cu km. The 7-day decline rate for 2003 is 2,485 cu km, and 2018 is 1,916, an average daily difference of 74. However, we already know that 2003 decline rate continues to increase into July, but 2014 not so much, so that 2014 crosses above 2003 on the DMI report for July 6, and stays there for almost all the days between then and Aug 16. So, if 2018 tracks like 2014 did, it will cross above 2003 at the end of next week. For me, that is an interesting ‘IF’. 2004 is a different story. It had a higher max than 2003, and a different melt trajectory. 2014 never crossed over it, but came within 1 cukm on Aug 16. The very next day, 2004 started its ice growth season, while 2014 kept declining all the way to the average. So, for me, it comes down to ‘how much like 2014 is 2018?’ The story will be told in the actual 2018 declines,and when its growth season starts. The NSR and NW passage are not usually open at the end of June… and the ice still along them is far from thick. there is something very wrong with the DMI ice extent map, as many areas coloured on on it are completely ice free, if you look at satellite photos. The ice extent and other ice conditions are not unusual or showing any sign of even a halt to ice decline, let alone a reversal. There are some unusual patterns this year and some surprises likely! You are still missing the point…. as usual. Griff – are u taking in to account the possibility of melt water on the ice which is very common this time of year and one of the sources of large errors in the ice vs water calculation? 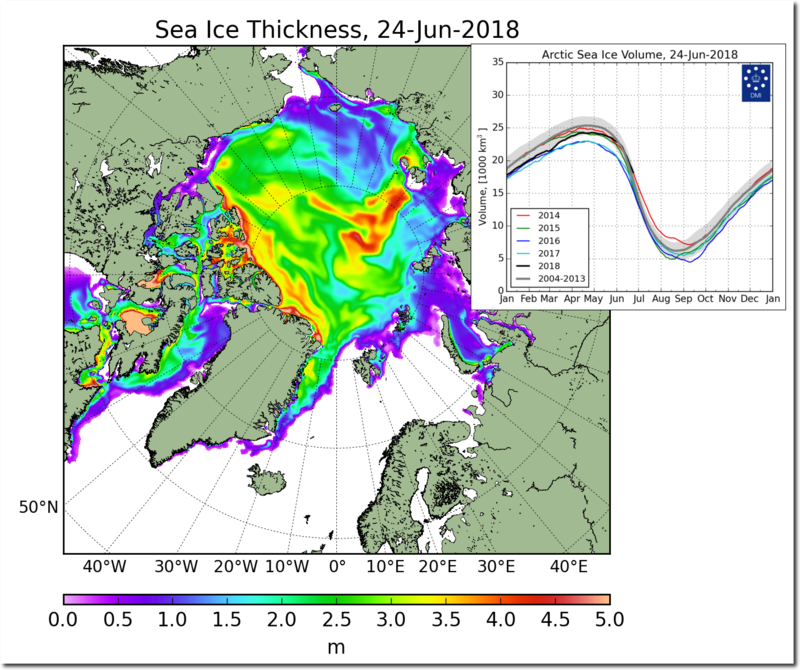 Stewart, the arctic sea ice forum publishes many satellite photos – and in them there are clearly not melt ponds but huge areas of completely ice free open water where DMI shows ice. poor griff, clutching not so much at straws, but at lead weights. Looks like the weather pattern for the week has strong high pressure over the western arctic, with strong low pressure over the eastern arctic. Some regions will see extent lower, as others increase. My question is, will Hudson Bay not completely melt out this year? When is the last time that happened. Griff is like a mindless little dog, he won’t stop yapping no matter what happens. It is annoying in a way, but in some sense, he is kind of cute! Canadian Ice Services says it’s only 1-2 weeks behind schedule in the eastern bay. They show it all as thick first year ice, but when you look at the regional pictures, it’s mostly thin and melting along the fringes. It’s not cute. It’s sad. The disillusionment, when it happens – and it will happen – will be tough. What you “expect” is totally irrelevant… a JOKE actually. The Arctic was no warmer during the winter than 1976 was. Why did you cherry pick that graph? 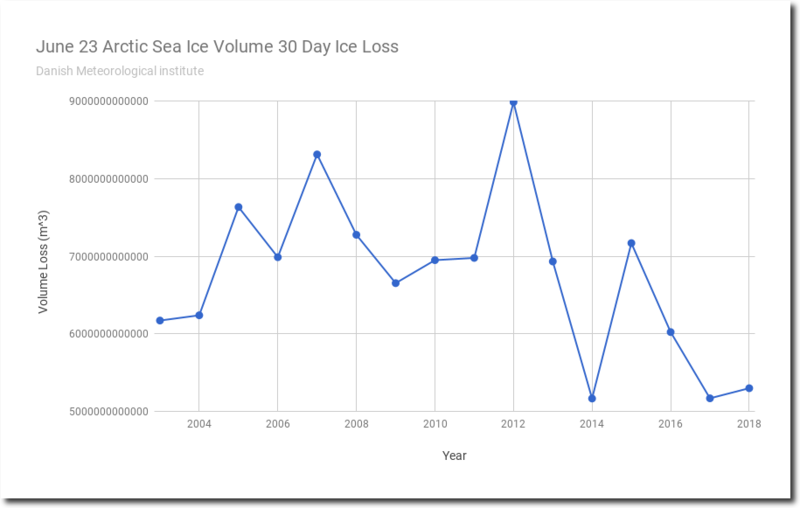 Why only look at the change in sea ice over a 15 year period when you have easy access to 38 years of data? Climate alarmists getting extremely desperate as their scam collapses. Gees Mike, don’t you realise that the recovery from the extreme high sea ice of the late 1970’s is over. 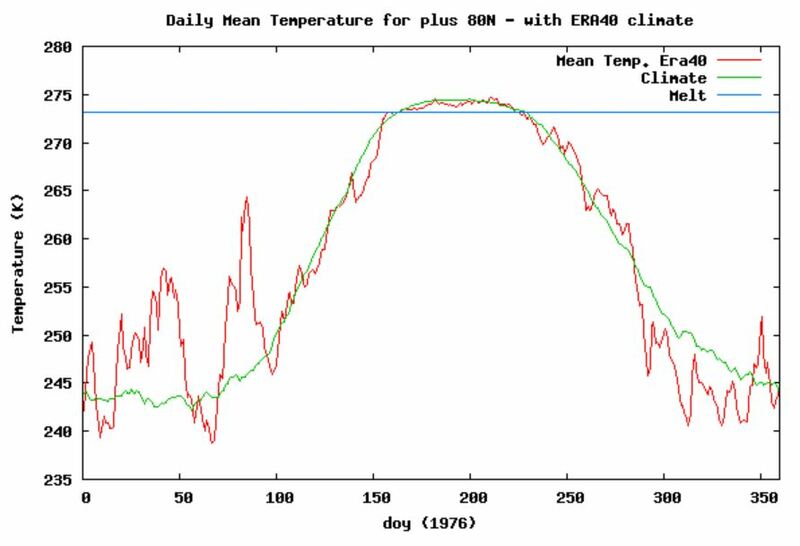 Unfortunately for the people living up there, it looks like the CYCLE of the AMO, which has been steady for close on 10-12 years, is changing towards its cooling stage, and sea ice will increase. Not good for the people living up there, a continued decrease would have been a massive benefit to them. Travel, commerce, fishing etc , would have become possible for more than a couple of months a year. 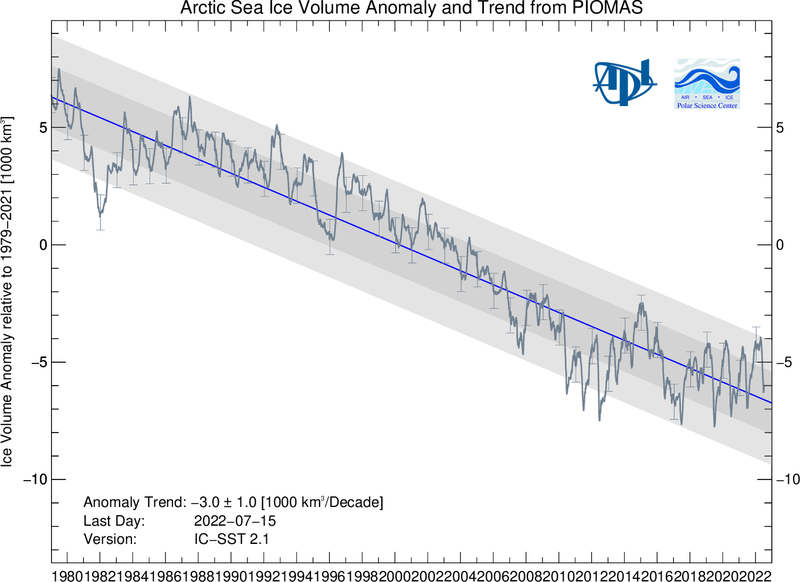 You do realise that current Arctic sea ice level are still in the top 10% of the last 10,000 years, don’t you ? ie they are still ANOMALOUSLY HIGH, after the extreme extents of the LIA and late 1970s. Have you been talking to them? reading the Gruniad, more likely.. There is still plenty of sea ice for their “traditional” way of life that they formed to get by through the LIA. You do realize that before the LIA there was A LOT LESS SEA ICE, don’t you, griff.